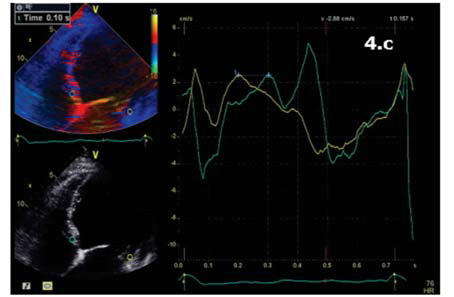 Left ventricular noncompaction (LVNC) is a rare congenital disorder which affects the normal compaction process of the myocardium during fetal development and it is characterized by prominent ventricular trabeculations and deep intertrabecular recesses on the luminal surface of the left ventricle1. The etiology and pathogenesis of LVNC is still a debate, the European Society of Cardiology (ESC) considers LVNC as an “unclassified cardiomyopathy” because LVNC can appear as a morphological trait of diverse cardiomyopathies, while the American Heart Association refers to LVNC as distinct primary genetic cardiomyopathy. Identification of mutations in the genes that encode the sarcomeric, cytoskeletal, and nuclear membrane proteins advocates for a genetic cause2. The clinical presentation ranges from asymptomatic forms to patients who develop heart failure, thromboembolism, ventricular arrhythmias and sudden cardiac death. 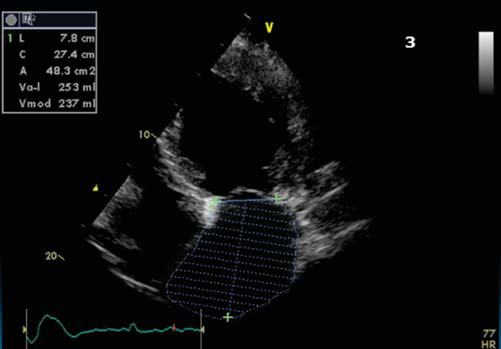 Echocardiography is a conventional diagnosis tool, but sometimes confirmation of diagnosis requires other techniques, including contrast ventriculography, CT and MRI. Widely accepted echocardiographic diagnostic criteria by Chin focus on the depth of the recesses compared with the height of the trabecula, while Jenni et al. underline the importance of the presence of a two-layered structure3,4. Differential diagnosis includes arrhythmogenic right-ventricular cardiomyopathy, hypertrophic or dilated cardiomyopathy, endocardial fi broelastosis and different other cardiomyopathies that can resemble with trabecular myocardium4. In conclusion, symptoms, diagnosis, and prognosis are variable because of the heterogeneous nature of this disease, making treatment often empirical and mimicking the treatment of other cardiomyopathies. However, there are management issues that should be addressed in each patient with LVNC, including genetic testing and family screening, the need for implantable cardioverter defi brillator placement, the role of anticoagulation in prevention of thromboembolic complications, and prescriptions/restrictions for implementation of physical activity5. We report the case of a 59 years old male, admitted in our clinic with syncope and heart failure (HF) symptoms functional class NYHA III and paroxysmal nocturnal episodes of intense dyspnea. Physical examination revealed low blood pressure (90/60 mmHg), irregular heart beats, moist crackles halfway up bilaterally, lower extremity pitting edema. The blood tests found electrolyte imbalance with mild hyperkalemia and moderate chronical renal disease (creatinine clearence 51ml/min). Figure 1. 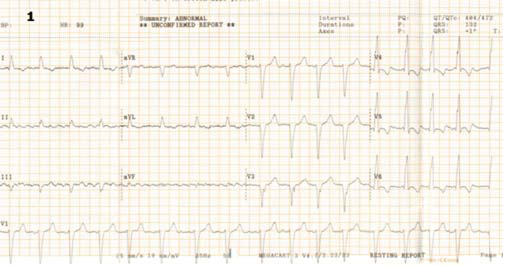 ECG performed at admission: atrial fibrillation with rapide ventricular response 99 b/min; complete left bundle brunch block, QRS = 132 ms, nothced R in DI, avL, V5-V6. Figure 2. Apical 4 chamber view. The EF was calculated as a average of several measurements. Figure 2.a. LVEDV = 300 ml. Figure 2.b. LVESV = 246 ml. Calculated EF = 18%. (Figure 4a,4b,4c). Interventricular dyssynchrony was defined as >40 ms difference between left ventricular and right ventricular pre-ejection time, measured by pulsed-wave Doppler6. More than 65 ms delay between the contraction of two different segments of LV shows intraventricular dyssinchronism and represent a good predictor to CRT7. 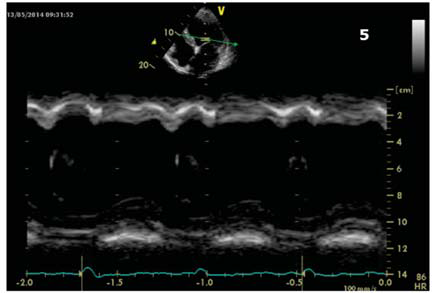 Septal flash was assessed in apical 4 chamber view (Figure 5). Speckle tracking ecography showed LV lateral wall dyskinesia (Figure 6). In apical 4 chamber view a particular aspect was noticed with prominent trabeculations at the apex and 1/3 apical on the lateral wall of LV (Figure 7). We performed contrast ecocardiography that revealed prominent trabeculations and deep intratrebecular recesses perfused by contrast at the apex, 1/3 apical of lateral wall, and inferior wall of LV (Figure 8a.b.c), fulfilling Chin and Jenni criteria for LVNC. Figure 3. 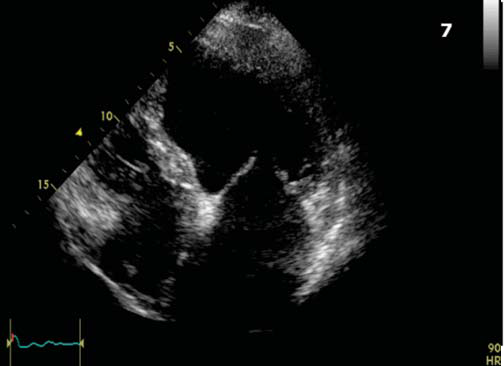 Apical 4 chamber view showing severe left atrium dilatation. 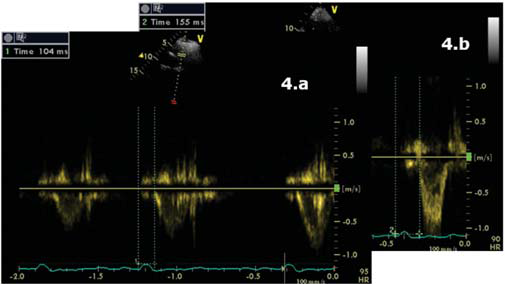 Figure 4.a Parasternal short axis view, pulsed-wave Doppler. 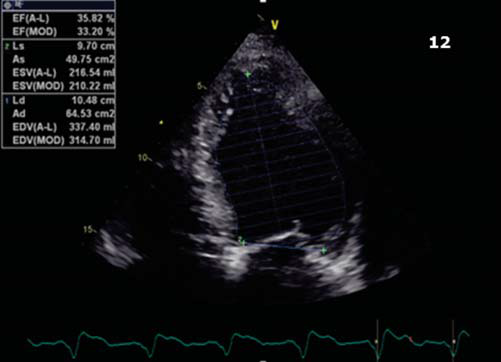 Pulmonary preejection time = 104 ms. 4.b Apical 5 chamber view, pulsed-wave Doppler. Aortic pre-ejection time 155 ms. Inter ventricular dyssinchrony = 51 ms. Figure 4.c Apical 4 chamber view. TDI pulsatil offline. 100 ms difference between septal wall (blue) and lateral wall (yellow) = intraventricular dyssinchrony. Figure 5. Apical 4 chamber view. M Mode through lateral and septal wall showing septal flash. Figure 6. Speckle tracking ecography. Longitudinal strain rate showing lateral wall dyskinesia (blue). Figure 7. Apical 4 chamber view. Particular aspect showing proeminent trabeculations at the apex and 1/3 apical on the lateral wall of LV. Coronary angiogram excluded significant coronary artery disease. Using direct punction left sublclavian vein approach we performed biventricular defibrillator implantation using two leads: I. right ventricle (2 coil defibrillator lead) and II. left ventricular bipolar lead placed in a posterolateral branch of coronary sinus (Figure 9a.b). The defibrillator was programed as follows: VVIR 80 b/min, VV interval 25 ms (after optimization both ECG and echocardiography); 2 zone configuration for VT detection: fi rst at 176 b/min (340 ms); and ventricular fi brillation (VF) from 200 b/min (300 ms). Post procedural outcome was favorable, without any complications. In-hospital treatment with furosemide 2*40 mg (i.v initially), amiodarone 200 mg, carvedilol 2*12,5 mg, candesartan 16 mg, rosuvastatinum 10 mg, acenocumarolum 4 mg was continued after discharge. Heart rate management was easely obtained using only betablocker/amiodarone and complete biventricular capture close to 100% was achived at discharge. During 1 year follow up period the patient needed multiple treatment readjustments (follow-ups each 3 months), with decreasing doses of diuretic and progressive increase of antihypertensive medication as the patient had multiple episodes of high blood pressure (the highest value 180/110 mmHg). by contrast on the inferior wall. c. Apical 4 chamber view. L2/L1 = 0.41 (<0.5, positive Chin criteria). At 1 year follow up the patient was hospitalized, although in NYHA functional class II, for evaluation after an episode of palpitations without syncope, but with internal electrical shock deliver. The EGG showed biventricular stimulation without spontaneous QRS complexes (Figure 10). The ecography confirmed the maintainance of improved ventricular contraction (Figure 11), EF = 35% (Figure 12), mild mitral regurgitation. The ICD interogation showed biventricular pacing 97%, 1 episode of VT 218 b/min, rapidly detected in VF zone, converted to sinus rhythm by internal electrical shock 36J (therefore no syncope occured: good tollerance of high ventricular rate which confi rms the improvement of clinical status). To provide biventricular pacing as closed to 100%, several modulation rate parameters were changed, such as activity sensor threshold, slope and reaction time to achieve a more physiological pacing behaviour, without loss of capture during physical activity (several exercise test were performed to check capture). The largest series to date for adults with LVNC are small but include the most information on the natural history of disease. The current recommendations for treatment follow the international guidelines of heart failure management. Figure 9. Flouroscopy images. a. Sinusography in left anterior oblique view. b. Antero-posterior view showing the right ventricle defi brillator lead and the left ventricle lead placed in a posterolateral branch of the coronary sinus. Treatment usually requires the combination of beta-blockers, ACE inhibitors/ARB, diu retics and aldosterone antagonists8. Oral anticoagulation is generally recommended to those presenting ventricular systolic dysfunction, antecedent of systemic embolism, presence of cardiac thrombus and atrial fibrillation9. ICD are frequently used for primary and secondary prevention in LVNC, but follow up data about are insufficient. A study published in 2011 evaluated indications and follow up in patients with LVNC and ICD implant both in primary and secondary prevention. Frequent appropriate ICD therapy was observed in both groups, supporting the application of current ICD guidelines for primary and secondary prevention of sudden cardiac death in LVNC10. Allthough ICD implant is a treatment option, its superiority over medical treatment is still a debate. 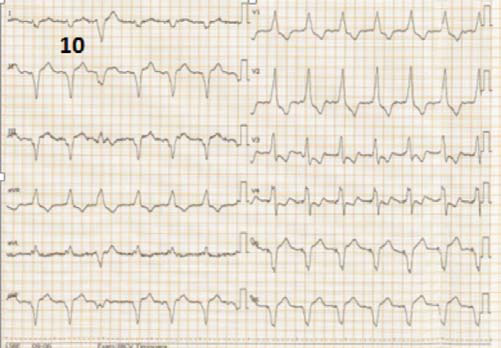 There are highly arrhythmogenic LVNC patient case review in the literature in which the authors prefered antiarrhythmic treatment, without need of an ICD11,12. Figure 10. ECG at 1 year follow up showing atrial fi brilation, biventricular rythym with R wave in V1, and negative QRS complex in D1, V5, V6. Figure 11. Speckle tracking ecography. Longitudinal strain rate showing improved contraction of LV lateral wall. Figure 12. Apical 4 chamber view. Calculated EF = 35%. Galizio et all. proposed a number of citeria for identifying patients with LVNC at risk of sudden cardiac death (SCD). A low ejection fraction EF <30%, and more than 2 risk factors (familly history of sudden death, syncope and nonsustained VT) were considerer cryteria for incresead risck of SCD and ICD implant. This pattern of risk stratifi cation of sudden death and the choice of patients who would be benefi ted most with the implantation of an ICD seems relevant, due to the observation of absence of sudden death in the group without ICD and the presence of appropriate (VT/VF) shocks in ICD group13. CRT improves morbidity and mortality in patients with desynchronized HF, but CRT response remains variable, and one of the determinants is HF etiology. 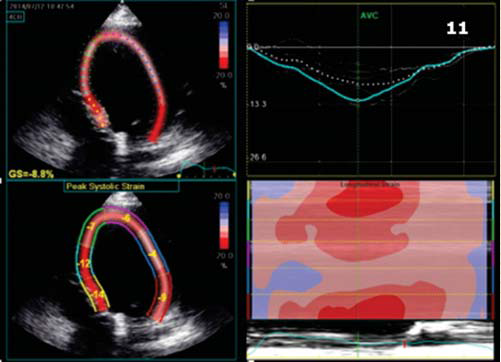 Studies about CRT in LVNC patients are rare and incomplete, and it is not yet clear if these patients would benefit from CRT. Qiu et all. 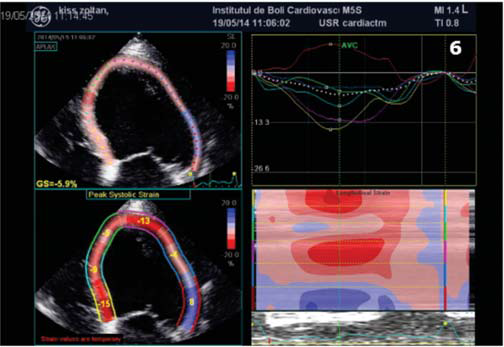 demonstrated that CRT improves heart function, morphology and mechanical dyssynchrony in LVNC patient14. He evaluated left ventricular remodeling and mechanical synchronicity before and after CRT in LVNC patients by comparing with idiopathic dilated cardiomyopathy (DCM) patients; he showed that compared with DCM group, there was no significant difference in LV response rate, improvement of LV function and dyssynchrony index. Furthermore, Penela et all. showed that mechanical dyssynchrony, amenable to correction with CRT, is common in patients with LVNC, independently from QRS width15. In conclusion, our presentation reports a case of LVNC cardiomyopathy diagnosed with ecocardiographic tools; associated HF with low EF and 1 syncopal episode with nonsustained VT on Holter ECG monitoring made reasonable CRT-D therapy. Appropriate use of the defibrillator and improving in LV contraction supports primary prevention ICD implant and CRT in patients with LVNC. 1. udeoji DU, Philip KJ, Morrissey RP, Phan A, Schwarz ER – Left ventricular noncompaction cardiomyopathy: updated review, Ther Adv Cardiovasc Dis. 2013 Oct;7(5):260-73. 3. Lin YN, Wang YQ, Yu Y, Cao Q, Wang F, Chen SY – Left ventricular noncompaction cardiomyopathy: a case report and literature review, Int J Clin Exp Med. 2014 Dec 15;7(12):5130-3. 8. Shemisa K, Li J, Tam M, Barcena J – Left ventricular noncompaction cardiomyopathy, Cardiovasc Diagn Ther. 2013 Sep; 3(3): 170–175. 9. Tavares de Melo MD, de Araújo Filho JA, Parga Filho JR, de Lima CR, Mady C, Kalil-Filho R, Salemi VM. – Noncompaction cardiomyopathy: a substrate for a thromboembolic event. BMC Cardiovasc Disord. 2015 Jan 24;15:7. 12. Patil VC, Patil HV, – Isolated Non-compaction Cardiomyopathy Presented with Ventricular Tachycardia, Heart Views. 2011 Apr-Jun; 12(2):74-78. 13. Galizio NO, Gonzalez JL, Favaloro LE, Diez M, Fernandez A, and co. Non-compaction cardiomyopathy. Risk stratification of sudden death for auomatic cardioverter defibrillator implantation. Rev Argent Cardiol 2011; 79: 14-20. 14. Qiu Q, Chen YX, Mai JT, Yuan WL, Wei YL and co. – Effects of cardiac resynchronization therapy on left ventricular remodeling and dyssynchrony in patients with left ventricular noncompaction and heart failure. Int J Cardiovasc Imaging. 2015 Feb;31(2):329-37. 15. Penela D, Bijnens B, Doltra A, Silva E, Castel MA, Berruezo A, Mont L, Weidemann F, Brugada J, Sitges M – Noncompaction cardiomyopathy is associated with mechanical dyssynchrony: a potential underlying mechanism for favorable response to cardiac resynchronization therapy. J Card Fail. 2013 Feb;19(2):80-6. doi: 10.1016/j.cardfail.